If you are looking for a frugal living post, than this is not the post for you. If you want to eat a moderately healthy diet without spending a fortune or clipping tons of coupons than you are in the right place. By the way, we live in the PNW, where grocery prices are a bit higher, but luckily we don’t have sales tax, yet. I don’t have access to Aldi’s or Save A Lot. We have Safeway, Kroger, Whole Foods, Trader Joe’s, Costco, Target, Winco, and Walmart in our area. When my husband and I first married, we were able to shop for about $50-75 a week for groceries. We didn’t earn much money either so part of this low budget was because we didn’t have a choice. Staples of our diet included Gatorade, energy drinks, frozen bean and cheese burritos, hot dogs, hamburgers, and sugary cereal. A diet of mostly carbs and refined sugar paired with a sedentary lifestyle, led to us both gaining a ton of weight. In the first couple years of marriage, I gained over 40 pounds from eating poorly. That doesn’t even include the baby weight I gained! After our first kiddo, we realized we both needed to lose weight. He is a whirlwind and we were both too out of shape to keep up. We knew that exercising and eating right would be hard but necessary. Before I had my second child, I had lost almost 50 pounds. My husband has lost even more. That is my proof that how we are eating is making a a big difference in our lives. I still had issues with the birth of my second kiddo, but it would have been worse if I hadn’t lost that 50 pounds. 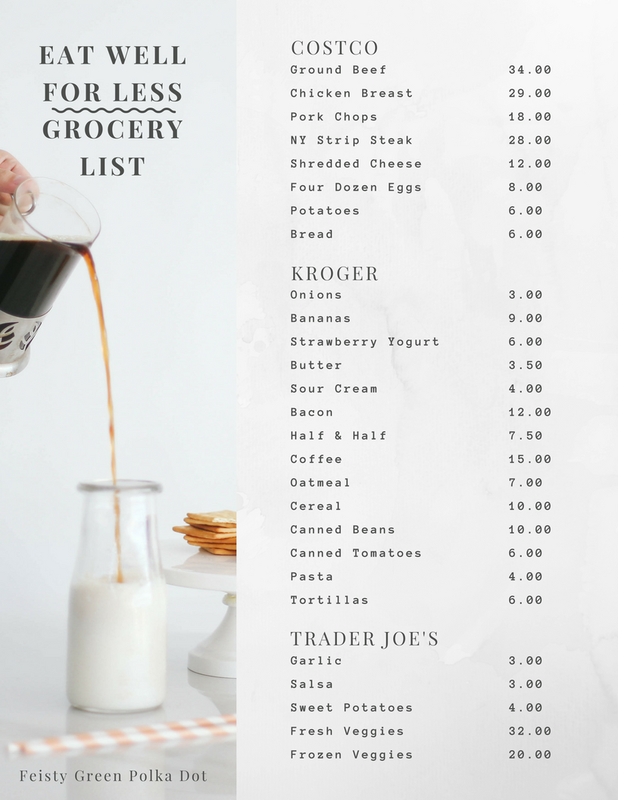 If you haven’t read my post on cutting your grocery bill, you should do that first. That post explains a large portion of the money saving techniques that I apply. While I love the paleo diet, it isn’t the secret to our weight loss. I know that statement will make some people upset, but it is true. Cutting out food groups and eating organic grass fed whatever, did not help us lose weight but it did make our grocery budget go through the roof. So what exactly do we buy? I serve meat at dinner 6 days a week. One day a week we have a meatless dinner. I will also serve bacon or sausage at breakfast on the weekends. If you have been to the grocery store lately, you probably know that the prices of meat are crazy. When I buy meat for the month, I budget $5 per day. That means we eat a lot of chicken, pork, and ground beef. When I can get steak at Costco for $6.99, I will buy a pack. I don’t buy roasts, stew meat, or any organic beef. Actually, I very rarely buy organic meat at all. If I were made of money, that would be a different story. If you don’t have a Costco or Sam’s Club you can still find good deal on meat at your local grocery store. Look for the big family packs. While you are at the store go ahead and buy yourself a Food Saver, if you don’t already have one. If I can get steak for a good price, I will buy 4 pounds. I sometimes buy a large bag of breakfast sausage. I do not buy my bacon in bulk as we don’t eat it often. This amount of meat will last more than a month but I like to have extra in the freezer in case I can’t get to the store. As for vegetables we eat mostly frozen and fresh vegetables. We eat at least one vegetable and sometimes two vegetables per dinner. I buy most of my vegetables from Trader Joe’s. I buy pepper onion mix, stir fry veggies, the eggplant mix, frozen asparagus, frozen mushrooms, and cauliflower rice. For fresh veggies I buy zucchini for zoodles and mixed hot peppers. We do eat potatoes once a week so I will buy a bag a sweet potatoes and bag of Yukon golds. I also buy a bag of onions. For canned goods, I buy kidney beans, black beans, and diced tomatoes. For dairy and the like, I buy two dozen eggs, unsalted butter, sour cream, strawberry yogurt, and a bottle of cream. I do buy cheddar cheese in bulk from Costco. My husband and I do not drink milk except for the splash of cream we put in our coffee. For pantry items, I buy a box of cereal (which lasts quite a while) , a couple of spaghetti sauces, and a box of pasta. One of our largest expenses is protein powder, which we buy 3 canisters a month from Amazon. I round out my shopping trip by buying the things I need for specific recipes, like fresh herbs or spices. So what don’t we buy? We don’t buy very much prepackaged foods. I typically don’t buy lunch meats, crackers, cookies, chips, energy drinks, sugary drinks, soda, candy, or frozen meals. Want to know what kind of dinners I make? Want to see my grocery list?